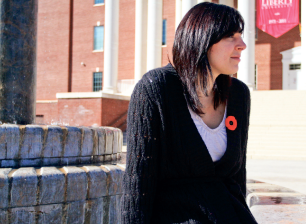 Liddell, a Liberty Student hailing from Red Lake, Ontario, is one of many Canadians who attempts to unite Canadians on Nov. 11 by having boxes of poppies shipped from home to distribute to her friends and fellow countrymen. While the United States will be honoring the American troops for Veteran’s Day, Nov. 11, many Canadians will be pinning their lapels with red, fabric poppies to further their country’s sentiment. “The poppy is a pretty vivid symbol,” Liddell said. The poppy made its mark on Canadian culture with the publishing of John McCrae’s “In Flander’s Fields” in 1915. McCrae was a Canadian physician and poet who enlisted in WWI. He was then ranked Major and appointed brigade-surgeon to the First Brigade of the Canadian Forces Artillery, according to his biography on flandersfieldsmusic.com. That poem was then published in Punch magazine the same year. Since then, the poem has become one of the most popular poems of remembrance in Canada and Europe. These poppies that bloom in that once-bloody field of Flanders in Ypres, Belgium, are now adorned by Canadians every Remembrance Day, Nov. 11. “I think of that poem every time I wear the poppy and realize that it’s up to us to carry on the legacy of the men and women who fought for us to be able to live in the freedom we enjoy today,” Liddell said. For Noble, who serves in the Canadian Military, seeing others wear a poppy brings a sense of pride. Even in a country other than their own, Both Liddell and Noble find it important to pin their poppies as a sign of remembrance. Canadians have traditionally displayed the “McCrae” poppy to symbolize our military Fallen, our war dead. Our lost family members and friends. wo million replicas used across Canada this first year. From this success she approached the British Legion clubs and sent reps out to other Dominions down under who supported the dual purpose concept too. In conjunction with the Great Silence, the pause to remember the Fallen wherever one is when the hour strikes 11 on the morning of November 11 each year is a powerful tradition in this country and our former-Empire cousins.